The past year has been and can be considered an eventful and fruitful year for Intel. No, we're not talking about the release of Intel's 'Prescott' Pentium 4 (though it's a significant technological milestone for them). What most people should still have a tinge of memory from the year 2003 was the release of the Intel Centrino Mobile Technology platform. A whole campaign was played out to ensure this platform and the mobile lifestyle slogan it carried was made known across the globe. The whole point behind this mobility package was the Pentium-M (codenamed Banias) processor, which was the empowering force that makes the Centrino technology such a huge sell-out. This tiny, yet beastly, processor literally single-handedly makes mobile computing enjoyable as it truly liberates the user from battery life woes and coupled with two other parts of the Centrino equation, the Intel 855 chipset and Intel PRO/Wireless network module, consumers can finally savour the true mobile computing experience. With aggressive marketing cooked up and ran by Intel with a seemingly infinite budget for the Centrino campaign, an entire chain of notebook vendors all eyeing on this huge pie quickly capitalized on Intel's marketing muscle and reached out to deliver notebooks based on this widely advertized technology (the catchy pastel colors of the logo do help as well). In no time at all, Centrino notebooks were sprouting everywhere, from computer mega-stores right down to family owned notebook retail outlets. If you walk into a notebook retail outlet now, you'll most probably be greeted by an array of Centrino-based notebooks, be it ultra-portables or desktop replacements, the Centrino logo is nearly stamped everywhere. As successful and speedy the Intel Pentium-M 'Banias' processor was, the harsh reality of technology progression will never stand still with just one excellent product. Technology development and software advancement dictates the need to move on with time. The current Pentium-M processor peaks out at 1.7GHz with its 130nm manufacturing process and while it has provided plenty of horsepower for notebooks during its lifetime  most notably able to deliver similar performance and in some cases besting its desktop counterpart while operating at lower clock speeds. The need for a faster processor to power applications of tomorrow will require a new and improved core with a higher clock speed envelope to ensure the processor stays a step ahead of tomorrow's need. Intel's answer to this was its new Pentium-M 'Dothan' mobile processor and it came to us in an Acer TravelMate 8000. 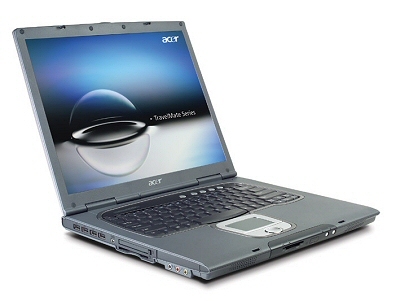 Acer TravelMate 8000 with an Intel Pentium-M processor 745 (1.8GHz).